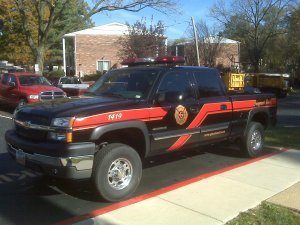 The Glendale Firehouse is located at 424 N. Sappington Rd. The station was built in 1926 and is located adjacent to the city hall and the police station. 1400 is the Fire Chief vehicle. 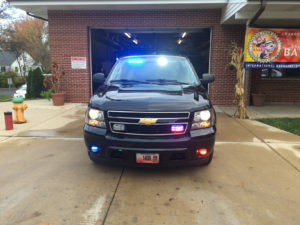 This vehicle is used for incident command at emergency calls and for administrative purposes. 1414 is the main rescue pumper used by the Glendale Fire Department. 1414 responds to fires, vehicle accidents, emergency medical calls and more. 1419 is used as an equipment and personnel mover. 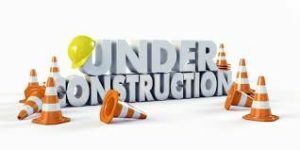 It is used as means to get extra personnel to emergency scenes, carry supplies, and pull equipment trailers. 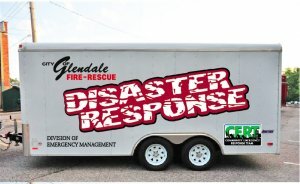 The Glendale Fire Department has created a Disaster Response Trailer. This trailer can be deployed in the event of a large disaster such as a tornado or earthquake. The trailer has a large supply of medical equipment that might be needed during a large scale disaster. 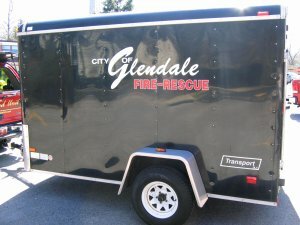 The Glendale Fire Department has a trailer dedicated for hauling and storage of some of it’s training props. This trailer can be used to haul large training equipment such as scba tunnels and other bulky training equipment to designated training sites.